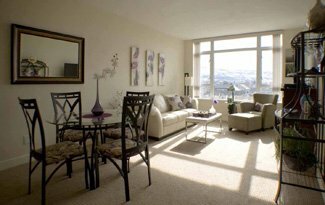 Immaculate one bedroom plus den unit in Lakeshore Towers, located across the street from Okanagan Lake. Cozy living room with built-in electric fireplace and picture windows that take in the city and mountain views. Kitchen features granite counters and quality stainless steel appliances. "Cheater" ensuite with soaker tub and separate shower. South-facing deck has been upgraded with outdoor tile and offers a natural gas outlet for your BBQ. The resort style complex has an outdoor swimming pool and hot tub, sauna, two workout gyms, three amenity rooms and two guest suites. Complete with a wine storage locker in the temperature controlled wine room, secure underground parking and storage locker.